The protozoan parasite, Trypanosoma cruzi, causes Chagas disease, a zoonotic disease that can be transmitted to humans by blood-sucking triatomine bugs. An infected triatomine insect vector (or “kissing” bug) takes a blood meal and releases trypomastigotes in its feces near the site of the bite wound. Trypomastigotes enter the host through the wound or through intact mucosal membranes, such as the conjunctiva . Common triatomine vector species for trypanosomiasis belong to the genera Triatoma, Rhodnius, and Panstrongylus. Inside the host, the trypomastigotes invade cells near the site of inoculation, where they differentiate into intracellular amastigotes . The amastigotes multiply by binary fission and differentiate into trypomastigotes, and then are released into the circulation as bloodstream trypomastigotes . Trypomastigotes infect cells from a variety of tissues and transform into intracellular amastigotes in new infection sites. Clinical manifestations can result from this infective cycle. The bloodstream trypomastigotes do not replicate (different from the African trypanosomes). Replication resumes only when the parasites enter another cell or are ingested by another vector. The “kissing” bug becomes infected by feeding on human or animal blood that contains circulating parasites . The ingested trypomastigotes transform into epimastigotes in the vector’s midgut . The parasites multiply and differentiate in the midgut and differentiate into infective metacyclic trypomastigotes in the hindgut . Trypanosoma cruzi can also be transmitted through blood transfusions, organ transplantation, transplacentally, and in laboratory accidents. The Americas from the southern United States to southern Argentina. Mostly in poor, rural areas of Mexico, Central America, and South America. Chronic Chagas disease is a major health problem in many Latin American countries. The acute phase is usually asymptomatic, but can present with manifestations that include fever, anorexia, lymphadenopathy, mild hepatosplenomegaly, and myocarditis. Romaña’s sign (unilateral palpebral and periocular swelling) may appear as a result of conjunctival contamination with the vector’s feces. A nodular lesion or furuncle, usually called chagoma, can appear at the site of inoculation. Most acute cases resolve over a period of a few weeks or months into an asymptomatic chronic form of the disease. The symptomatic chronic form may not occur for years or even decades after initial infection. Its manifestations include cardiomyopathy (the most serious manifestation); pathologies of the digestive tract such as megaesophagus and megacolon; and weight loss. Chronic Chagas disease and its complications can be fatal. Trypanosoma cruzi in thick blood smears stained with Giemsa. Trypansoma cruzi trypomastigotes are the only stage found in the blood of an infected person. Motile circulating trypomastigotes are readily seen on slides of fresh anticoagulated blood in acute infection but are rarely detectable by microscopy in chronic T. cruzi infection. A typical trypomastigote has a large, subterminal or terminal kinetoplast, a centrally located nucleus, an undulating membrane, and a flagellum running along the undulating membrane, leaving the body at the anterior end. 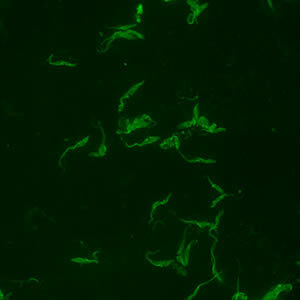 Trypanosomes measure from 12 to 30 µm in length. Trypomastigotes may be seen in cerebrospinal fluid (CSF) in central nervous system infections; also the amastigote stage parasite may be seen in histopathology specimens from affected organs. Figure A: T. cruzi trypomastigotes in a thick blood smear stained with Giemsa. Figure B: T. cruzi trypomastigotes in a thick blood smear stained with Giemsa. Figure C: T. cruzi trypomastigotes in a thick blood smear stained with Giemsa. T. cruzi in thin blood smears stained with Giemsa. Figure A: T. cruzi trypomastigote in a thin blood smear stained with Giemsa. Note the typical C-shape of the trypomastigote that characterizes T. cruzi in fixed blood smears. Figure D: Higher magnification of Figure C, T. cruzi. Figure B: Three T. cruzi trypomastigotes in a thin blood smear stained with Giemsa. Figure C: T. cruzi trypomastigote in a thin blood smear stained with Giemsa. Figure A: T. cruzi trypomastigote in a thin blood smear stained with Giemsa. Figure E: T. cruzi trypomastigote in a thin blood smear stained with Giemsa. Figure B: Higher magnification of Figure A, T. cruzi. Figure F: Higher magnification of Figure E, T. cruzi. Figure C: T. cruzi trypomastigote in a thin blood smear stained with Giemsa. Note the more anterior location of the nucleus. T. cruzi in cerebrospinal fluid (CSF) stained with Giemsa. Figure A: Trypanosoma cruzi trypomastigote in cerebrospinal fluid (CSF) stained with Giemsa. Figure B: Trypanosoma cruzi trypomastigote in cerebrospinal fluid (CSF) stained with Giemsa. T. cruzi amastigotes in heart tissue. Trypomastigotes of T. cruzi are the only stage found circulating in human blood or CSF. In tissue, the parasite forms amastigotes characterized by a single nucleus and kinetoplast. The amastigotes of T. cruzi are morphologically indistinguishable from those of Leishmania spp. Figure A: Trypanosoma cruzi amastigotes in heart tissue. The section is stained with hematoxylin and eosin (H&E). Figure E: Trypanosoma cruzi amastigotes in heart tissue. The section is stained with H&E. Figure B: Higher magnification of Figure A. Figure F: Higher magnification of Figure E. The amastigotes in this image appear to be transforming into trypomastigotes. Figure C: Trypanosoma cruzi amastigotes in heart tissue. The section is stained with H&E. Figure D: Higher magnification of Figure C.
T. cruzi epimastigotes, from culture. The epimastigote stage is not seen in humans but can be found in the midgut of triatomines that have ingested trypomastigotes from an infected host. Figure A: Trypanosoma cruzi epimastigote from culture. Note the location of the kinetoplast anterior to the nucleus. Figure B: Trypanosoma cruzi epimastigotes from culture. Note the location of the kinetoplast anterior to the nucleus. Triatomine bug, the T. cruzi vector. Trypanosoma cruzi is transmitted by kissing bugs (Hemiptera: Reduviidae). The most common genera responsible for transmission of the disease are Triatoma, Rhodnius, and Panstrongylus. Infection usually occurs after bugs defecate on the bite site and are rubbed into the wound by the host scratching. Nearctic species of triatomine bugs do not exhibit this behavior of defecating at the bite site. As such, there is a low risk of natural vector-borne transmission of T. cruzi in the United States . Figure A: Triatomine bug, Trypanosoma cruzi vector. Figure B: Triatomine bugs, Trypanosoma cruzi vectors. Figure C: Triatomine bug, Trypanosoma cruzi vector, defecating on the wound after taking a blood meal. In the acute stage of the disease, diagnosis may be made by the finding of trypomastigotes in circulating blood or cerebral spinal fluid (CSF). During the chronic stage, trypomastigotes are usually not found circulating in blood and serologic testing is recommended. Amastigotes may be found in biopsy specimens stained with hematoxylin-and-eosin (H&E) or Giemsa. Positive IFA result with T. cruzi antigen (magnification 400x). Infections with Trypanosoma cruzi are common in Mexico, Central America, and South America, and most people with Chagas disease in the United States acquired their infections in endemic countries. The transmission of Chagas disease via blood transfusion is a recognized risk, however screening tests were approved by the Food and Drug Administration and they are currently in use by blood banks. During the acute phase of illness, blood film examination generally reveals the presence of trypomastigotes. During the chronic phase of infection, parasitemia is low; immunodiagnosis is a useful technique for determining whether the patient is infected. Diagnosis of chronic Chagas disease is made after consideration of the patient’s clinical findings, as well as by the likelihood of being infected, such as having lived in an endemic country. Diagnosis is generally made by testing with at least two different serologic tests. The indirect fluorescent antibody (IFA) test and a commercial enzyme immuno assay (EIA) are available at CDC. When using this test cross-reactivity can occur with sera from patients with leishmaniasis, a protozoan disease that occurs in some of the same geographical areas as T. cruzi. CDC also utilizes an FDA-cleared enzyme immunoassay (EIA). This assay uses recombinant antigens for antibody detection and provides additional information to inform the diagnosis. Various serologic methods are commercially available in other countries for laboratory diagnosis of Chagas disease. The sensitivity and specificity of these tests are highly variable. CDC recommends confirmatory testing if positive or negative results obtained elsewhere are suspicious. Molecular diagnosis of Chagas disease is performed for cases of transfusion or transplant transmission are suspected and for congenital Chagas. Laboratory exposures can also be monitored using PCR. At CDC molecular detection of T. cruzi DNA is performed using a combination of three real-time PCR assays. Acceptable specimen types are EDTA blood (minimum of 2.2 ml), heart biopsy tissue (in saline or paraffin-embedded) and, in cases of suspected cerebral involvement, CSF. Using PCR to detect Trypanosoma cruzi DNA in EDTA blood is appropriate only when the parasitemia is expected to be high, such as in the acute phase of the infection or in re-activation of chronic Chagas disease due to immunosuppression. PCR can also be useful for early detection of T. cruzi in transplant-transmitted recipients of organs from donors with chronic Chagas disease. The diagnosis of chronic Chagas disease in patients without immunosuppression should be performed with serology. Diez M, Favaloro L, Bertolotti A, Burgos JM, Vigliano C, Lastra MP, Levin MJ, Arnedo A, Nagel C, Schijman AG, Favaloro RR. Usefulness of PCR Strategies For Early Diagnosis of Chagas’ Disease Reactivation and Treatment Follow-Up in Heart Transplantation. American Journal of Transplantation. 2007; 7: 1633–1640. Afonso AM, Ebell MH, Tarleton RL. A systematic review of high quality diagnostic tests for Chagas disease. PLoS Negl Trop Dis. 2012; 6(11):e1881. Qvarnstrom Y, Schijman AG, Veron V, Aznar C, Steurer F, da Silva AJ. Sensitive and specific detection of Trypanosoma cruzi DNA in clinical specimens using a multi-target real-time PCR approach. PLoS Neglected Tropical Diseases. 2012; 6: e1689. Treatment Information for Tryanosoma cruzi infection can be found at https://www.cdc.gov/parasites/chagas/health_professionals/tx.html.